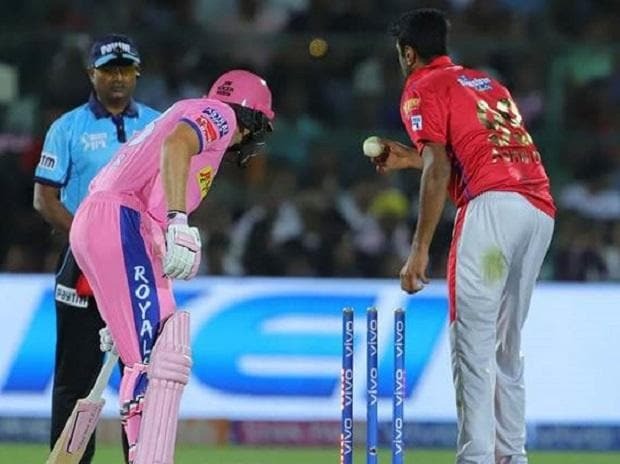 The cricketing world seemed divided in the 'spirit of the game' debate triggered by Ravichandran Ashwin's 'Mankading' of Jos Butter in an IPL match between Kings XI Punjab and Rajasthan Royals in Jaipur. The incident happened Monday night when Kings XI Punjab skipper Ashwin ran out Rajasthan Royals' Buttler, who was at the non-strikers' end, without giving him any warning while bowling the 13th over of the match. Informally named after the legendary Vinoo Mankad, who first did it in 1947 against Australia, 'Mankading' is when a bowler dismisses a non-striker by removing the bails in the process of delivering the ball with the batsman outside the crease. Though this is a legally permissible dismissal, it is widely considered against the spirit of the game. Though there have been such dismissals in the past, the incident sparked a fresh debate on the 'spirit of the game'. While Ashwin received support from former Australian players Mitchell Johnson and Dean Jones, spin legend and Rajasthan Royals brand ambassador Shane Warne and England ODI captain Eoin Morgan lashed out at the Indian spinner. "My thoughts on the Mankad. Its not cheating, it's not against the spirit as it's in the rules you can do it. Personally I would warn someone if I was to do it but the batsman should also play fair by staying behind the crease. It's a bit like the underarm serve in tennis right??" Johnson, who was once a part of Kings XI Punjab, wrote on his twitter handle. Former Australian batsman Dean Jones also came out in support of Ashwin. "Don't blame Ashwin here. As it's allowed in the Laws of the game.. how is it disrespectful or against the spirit of the game if it's allowed within the Laws of game? Blame the administrators for making the Law," he wrote. The Marylebone Cricket Club (MCC), which is the custodian of cricket laws, had made subtle changes to the rules on running out of non-strikers by bowlers in their run-up in 2017. The law gives bowlers the right to run out the non-striker up to the instant at which they "would be expected to deliver the ball". Morgan, however, believes Ashwin has set a "terrible" example for the young generation of cricketers. "I can't believe what I'm seeing!! @IPL Terrible example to set for young kids coming through. In time I think Ashwin will regret that," Morgan, who too has played for Kings XI Punjab in the past, tweeted. England batman Jason Roy too expressed shock at Ashwin's action. "Ashwin, that's shocking behaviour! Very disappointed to see that," he wrote in his twitter handle. Former England skipper Michael Vaughan said Buttler should have been at least warned. "If @josbuttler had been warned well that's fine ... if he hasn't and it's the first time I think @ashwinravi99 is completely out of order ... watch how often this happens from now on !!!!!!! #IPL," he wrote. "The Laws state it's OUT ... Still doesn't mean I like it at all ... just think it's a bad look for the game ... I would prefer a 1 warning rule then after that, it's a free for all ... only my opinion so don't abuse please ... or you can if you want .. I am not arsed #OnOn #IPL. Warne was most critical of Ashwin, calling his action "disgraceful" and against the spirit of the game. "So disappointed in @ashwinravi99 as a Captain & as a person. All captains sign the #IPL wall & agree to play in the spirit of the game. RA had no intention of delivering the ball - so it should have been called a dead ball. Over to u BCCI - this a not a good look for the #IPL," Warne wrote in his twitter handle. "Ashwin's actions were simply disgraceful, and I hope the BCCI doesn't condone this sort of behaviour in the #IPL ! #spiritofthegame." South African pacer Dale Steyn was also critical of Ashwin. "He ain't winning any spirit of cricket awards is old Ashwin," he wrote. Former New Zealand cricketer Scott Styris felt the TV umpire didn't take a right call after the incident. "My opinion on the Buttler/Ashwin controversy is that its NOT Buttlers fault and its NOT Ashwins fault either Ashwin is entitled to appeal. I thought the TV umpire made the incorrect decision Should've been dead ball..... play on," he tweeted.